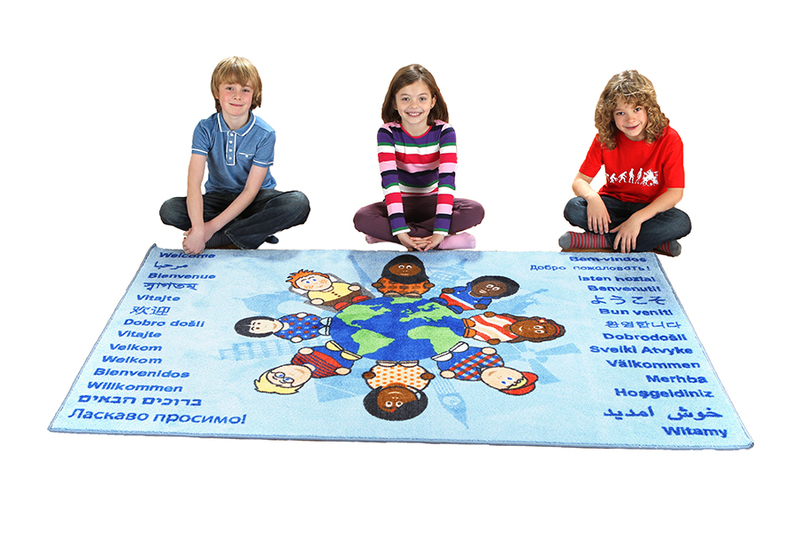 The Children of the World Welcome Educational Rug illustrates children from different cultures and the word ‘welcome’ in multiple languages. Ideal for reception areas in school, pre-school and nurseries or it can be used in the classroom for group discussions. The distinctively designed classroom carpet features a welcome in 30 different languages. Manufactured using a durable tuf-loop pile which is a tightly woven and robust soft textured twisted Nylon loop, ideal for high wear areas such as walk ways, receptions or central classroom areas. The durable and robust rugs features a specially designed Rhombus anti-skid latex backing which allows safe and continuous use on any surface. Complete with a 1 year manufacturer’s warranty and conforms to safety standards EN71 Parts 1, 2 and 3. Manufactured to order and dispatched within 2 weeks subject to availability.